In Luhansk sector main hostilities occurred in the morning and in the afternoon in Popasna district. Militants attacked several Ukrainian frontline positions at once with mortars, armor and light weapons. Ukrainian troops actively responded with fire. Hostile activity significantly decreased after 15:00. Two hostile attacks occurred in Krymske and Novotoshkivske. “In total, 11 hostile attacks took place in Luhansk sector yesterday, and six of them involved heavy weapons. The fired over 45 mortar rounds at our positions,” said Ukrainian Ministry of Defense on ATO – related issues Colonel Oleksandr Motuzyanyk at a press briefing at Ukraine Crisis Media Center. In Donetsk sector Ukrainian troops recorded 18 incidents of ceasefire violations, and eight of them involved heavy weapons. The situation was extremely restless near Avdiivka and the adjacent positions – fromantic Kamianka to Pisky. Militants started attacks after midnight. 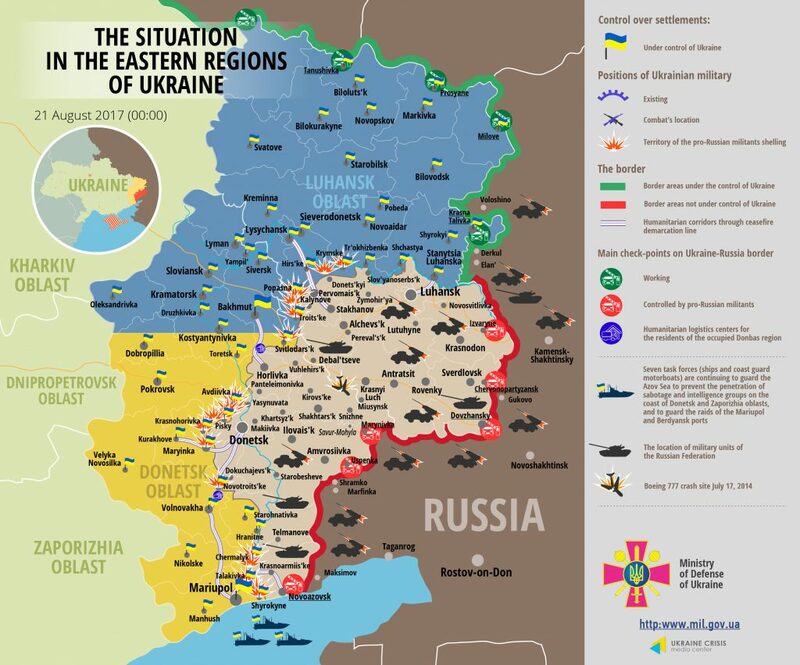 The situation deteriorated in the afternoon when Russian proxies started using heavy armor. “The enemy shot from cannons in Kamianka and used mortars and Grad-P systems in Avdiivka”. In Opytne they were shooting from mortars, in Pisky from mortars, tank and cannons, and in Nevelske from mortars. The fired over 130 corresponding rounds – mortars, missiles and rockets – at our positions,” said Col. Motuzyanyk. Ukrainian troops responded with fire. Moreover, a brief firefight involving an APC occurred in Luhanske in the evening. In Mariupol sector hostilities continued along the entire frontline. A residential quarter came under hostile fire in Maryinka. Mortar attacks happened in Krasnohorivka, Chermalyk and Pavlopil. “The enemy was traditionally active in the afternoon when they attacked virtually every stronghold in Pavlopil – Shyrokyne frontline. ATO troops actively responded with fire,” said the spokesman. In total, militants attacked 18 times in this sector, using heavy weapons three times. No Ukrainian serviceman was killed in action yesterday, but five were wounded. According to the Ministry of Defense, 30 militants were killed last week and 51 wounded. Moreover, three units of hostile equipment – mortar, ZIL truck and a tank. Report on the military developments as of August 20 is available here. Interactive data on the shelling: chronology shelling chart and the interactive map.